He had to work late Thursday, got home late, and was on call the rest of the night. Since he was going to be on call all day Saturday, which meant we couldn't go anywhere because if there was a problem, he had to log in within 5-10 minutes to try to fix it, Friday night turned into errand/shopping night. But cookies are yummy and so even without a party to attend and friends to share them with, we decided to bake them Saturday afternoon. 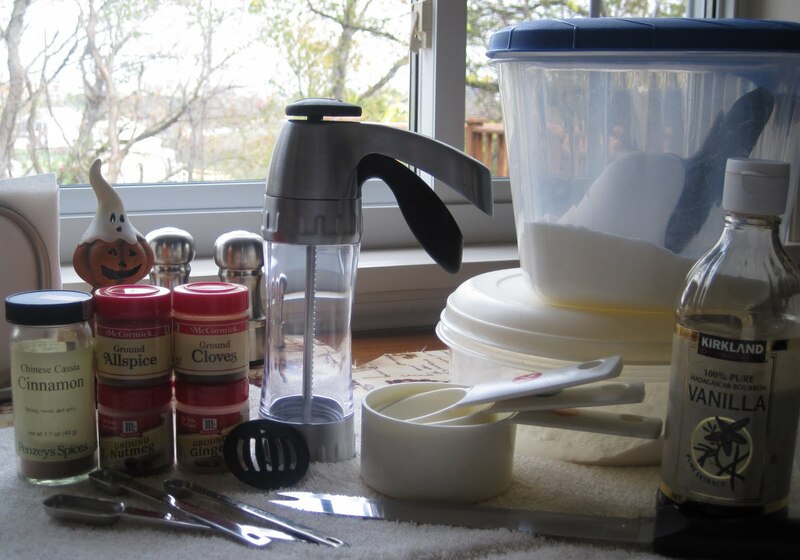 While SP showered, I gathered the ingredients/equipment and measured out the ingredients. 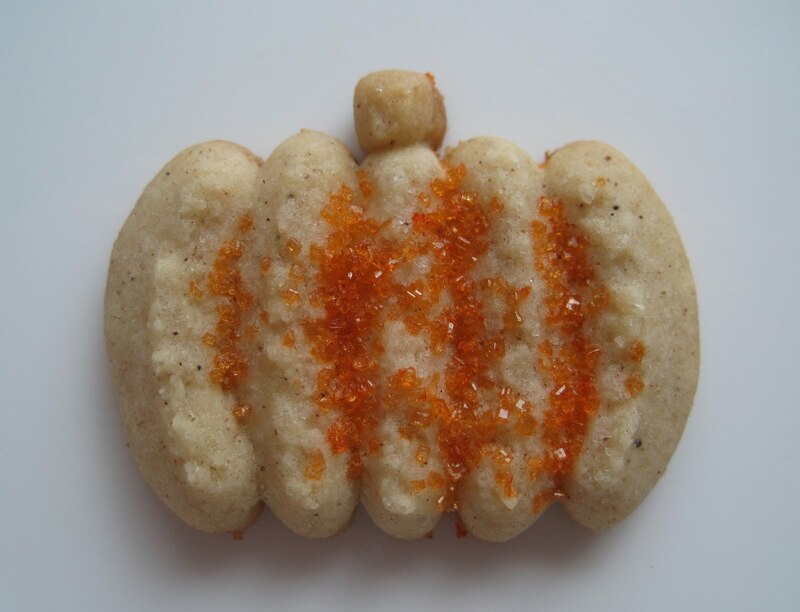 These cookies were inspired by the pumpkin disk in the new cookie press (specifically a Wilton Cookie Pro Ultra II Cookie Press). I've been waiting since my bridal shower for the chance to break out the new press and make pumpkin shaped spritz. 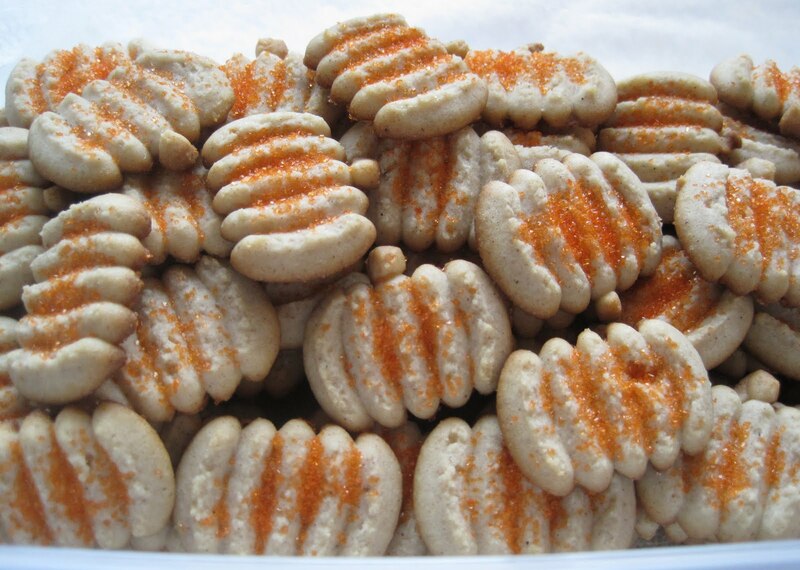 Originally, I wanted to make pumpkin flavored pumpkin spritz cookies, but turns out we didn't have that can of pumpkin I thought we had. 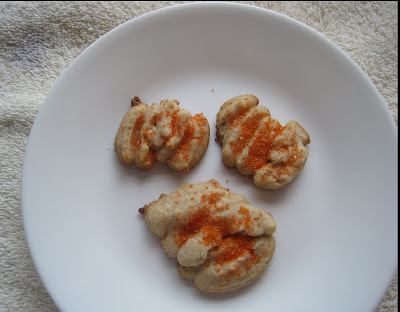 Instead, we made Spice Spritz Cookies. First step: cream together the spices, sugar, butter, and egg. It smelled so good from the cinnamon, allspice, cloves, ginger, and nutmeg. Then blend in the flour. 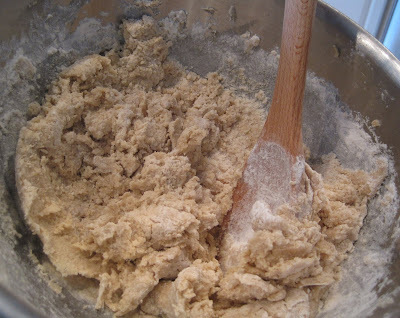 We used a mixer to get most of the flour incorporated then finished using a wooden spoon. Then it was time to spritz! The new press is a dream compared to the old one that broke last Christmas. I could not use the old press. I just couldn't press it and have the cookie land properly on the cookie sheet. I didn't actually try this press - SP was in charge of pressing while I sprinkled and baked and then put them on cooling racks. But he says the new press is amazingly easy. In spite of the supposed ease, there were a few issues with the pumpkin disk: sometimes the stem of the pumpkin wouldn't form and we had stemless pumpkins or they just came out a little mangled: I sprinkled on the orange sugar and put them in the 375 degree oven. 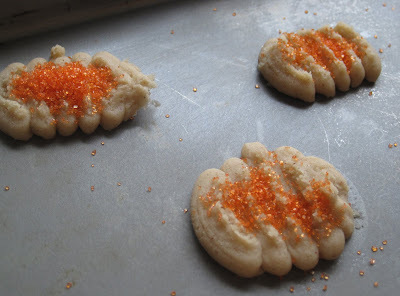 As we have found with most spritz cookie recipes, ours bake in significantly less time than the recipe says. This time, they took just 7-8 minutes, not 10-14 minutes. I also got to use my new silicone cookie spatula! It's small and cute and a great size for small cookies, but I did find the feeling of using a silicone spatula a bit odd. 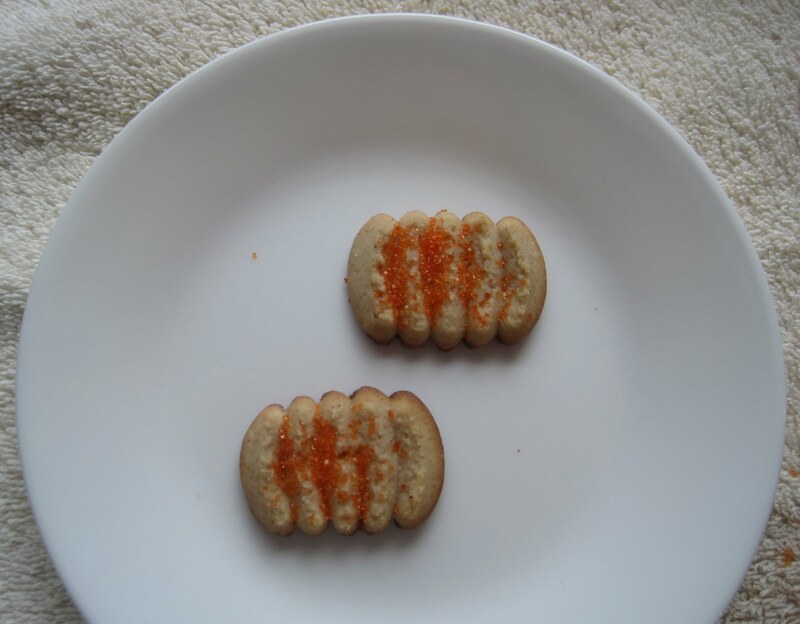 It felt different as I scooped off the cookies. But it's a lot more maneuverable between the cookies, and other cookies didn't get inadvertently dented or smushed as I tried to scoop off another cookie. Here are 4 pumpkin shaped spice spritz cookies, waiting to be devoured. Of course we had to taste some (and photograph some). It's quality control. These are yummy! Terrific spice taste. I can taste the cloves most, but also can pick up the cinnamon and nutmeg. These are not as crisp as SP's Christmas spritz, but that's fine with me since I don't like super crisp cookies. But they are not a soft spritz either - there's definitely a bit of crispness. 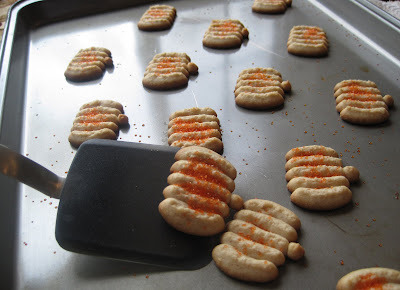 What fun would a food blog be without photos of the mangled mistakes? Those ones didn't come out of the press nicely. They look appropriately Halloween creepy, right?! 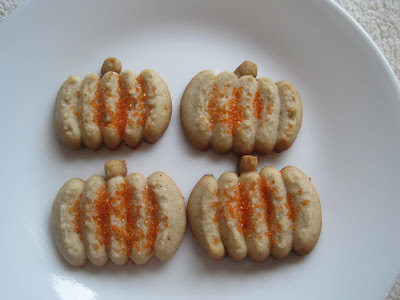 These ones are missing their stems and just look like... well, a spritz cookie: Here's the 'pumpkin patch,' as I am calling the container of cookies: I think we got about 6-7 dozen cookies from this recipe. Spritz cookies are small. It certainly doesn't look like we got 6-7 dozen cookies. And it's way too easy to eat 6 at a time - they're bite sized. It's almost like eating chips! Preheat oven to 375 deg F. Cream together butter, sugar, egg spices and salt. Blend in flour. Following the manufacturers' directions, load dough into cookie press. 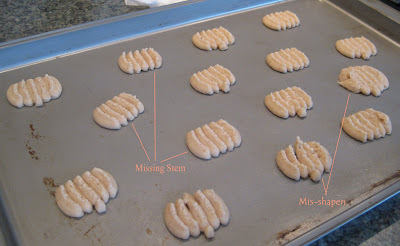 Press shapes onto ungreased baking sheet, spacing 2" apart. 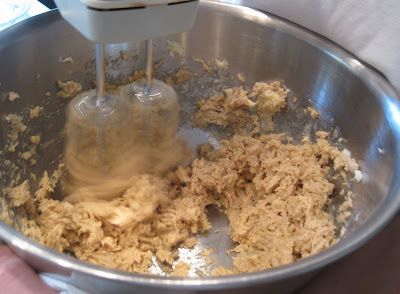 Note: cookie press works best if dough is at room temperature. Bake cookies in center of oven for 10-14 minutes, or until lightly browned.